(Newser) – A zombie-free Florida city is trying to figure out who issued a zombie alert to thousands of people during a power outage early Sunday. "There are now far less than seven thousand three hundred and eighty customers involved due to extreme zombie activity,” the alert sent to cell phones warned residents of Lake Worth. "Restoration time uncertain." City spokesman Ben Kerr tells the Palm Beach Post that an investigation is ongoing. He says the city doesn't know who hacked the alert system, but they don't believe it was an employee or former employee. "No one was fired for it," Kerr says. "Now the system has been scrubbed and there will be no further zombie messaging until the actual zombie investigation comes." Dont make fun of zombies they are new persecuted minority, its not there fault they have to eat human flesh they where born that way. 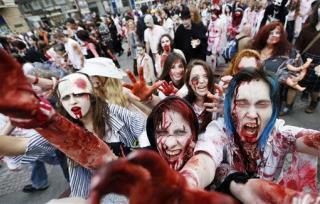 People soo into zombies I think have no idea what it would really mean.... THE END YOU FOOLS!